JUBA, South Sudan, Mar 30 2016 (IPS) - A single phone call from an irate security official is enough to shutdown a newspaper in Sudan. Security agents sometimes employ unorthodox methods: they storm the premises of a newspaper or a printing press and confiscate print runs in full view of employees. No reasons are provided. And there is no legal recourse. Sudan’s widely criticised 2010 national security law enables the country’s dreaded security agents to operate with complete impunity. The latest journalist to fall into the trap of the National Intelligence and Security Services (NISS) is Faisal Mohamed Salih, who is no stranger to state harassment. Salih said security agents prevented him from travelling to Britain on March 25. “They told me that my name was placed on a travel-ban list and my passport was seized,” he posted on his Facebook page, after he was turned away from Khartoum International Airport. A fierce critic of the Islamic regime, Salih is the winner of the Peter Mackler Award for courageous and ethnical journalism in 2013. Salih’s predicament is just the tip of an iceberg in a country where journalists and media houses are constantly under attack. Al-Ayam, Al-Mustaqilla and Al-Sudani are the latest newspapers to face the wrath of the security organs. In one of the most brazen raids, security agents, under the cover of the early hours, tormed a printing house in the national capital, Khartoum on March 15 and seized 20,000 copies of Al-Sudani newspaper, without giving reasons. Sources within Al-Sudani say the newspaper incurred a loss of 70,000 SSG (US$5,800) as a result of the raid. Such raids weaken newspapers economically and prevent the public from reading what the authorities want to be kept secret, journalists and media watchdog say. 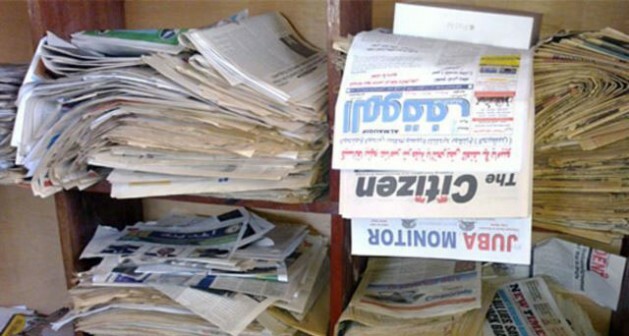 The raid on Al-Sudani happened as journalists at Al-Tayar, another daily that has been closed since December 2015, were staging what has now become a daily open hunger strike to force the authorities in Khartoum to permit the newspaper to resume operations. Few journalists believe that the hunger strike will work. “Hunger strike may work in the West where the spectre of such an activity always hangs heavily on the conscience of society. But in Sudan, if you go on a hunger strike you may be considered abnormal and your action will be regarded as un-Islamic. Perhaps only human rights groups, friends and members of your family may sympathise with you but not the government,” Victor Keri Wani, author of ‘’Mass Media in Sudan, Experience of the South 1940-2005’’, told IPS in an interview. This is not the first time that Al-Tayar, a critic of the regime, has been closed by the security agents since it began publication in 2009.
International media watchdog, Reporters Without Borders, said eight issues of the newspaper have been seized since the start of 2015, four of them in February 2015 alone. The watchdog said security agents also briefly shutdown the newspaper in 2012 after it blasted the NISS for illegally using electronic gadgets to spy on opposition groups. In the same edition, Al-Tayar also ruffled the feathers of some of the most powerful Islamists by publishing a report on corruption in local governments. Reporters Without Border recorded a total of 35 newspaper issues seized by the security agents in 2014 alone. A week never passes without seizure of print runs or closure of a newspaper by security agents. “The media in the Sudan is heavily censored and strictly controlled by the security organs,” professor William Hai Zaza, the head of the Department of Mass Communications at the University of Juba, told IPS in an interview. The bad blood between the media and security agents began after the junta, led by Omar al-Bashir, usurped power in a military coup, effectively deposing an elected civilian government, in June 1989. The junta set up pro-government publications to promote its vision of Islam and Arabism. Journalists who refused to share the junta’s views were either jailed or fled the country. It is an open secret in the Sudan that the Islamic government continues to fund some publications to toe its strict policy line. “The newspapers are allowed limited space for mild criticism of the government. These criticisms are used by the government to howcase its commitment to uphold the freedom of expression in the country,” Zaza said. Reporters Without Borders has condemned the closing of Al-Tayar. “We call for Al-Tayar to be reopened at once so that it can continue providing the public with news coverage,” said Clea Kahn-Sriber, the head of the body’s Africa desk, in a statement posted on the group’s website. In the 2000s, Sudanese journalists had feared that state agents were bent on a policy to eliminate them. This perception was influenced by the 2006 incident in which unknown gunmen kidnapped and beheaded the editor-in-chief of Al-Wifag newspaper, Mohamed Taha, sending a chill in the media fraternity in Khartoum. The case has remained unsolved to this day in a city known for its watertight security network. Then journalist Lubna Mohamed al Hussein, whose case attracted international media attention in 2009, was detained and fined for wearing a pair of trousers, under Sudan’s decency law. Sometimes local problems tend to override the loyalty of pro-government journalists, landing them in trouble. “For example, people around Katjabas Dam in the north of the country are always protesting against the construction of the dam. And if you happened to be a journalist from that area, surely, you’ll get sympathetic and publish the story, and your paper will be closed,” Wani explained. That is why Khartoum’s several private FM radio stations have chosen to play it safe by broadcasting entertainment or sports 24 hours a day. Security agents, who don’t pay much attention to them, deem entertainment and sports as less sensitive. “Journalism is a dangerous profession in the Sudan. Media practitioners must protect their lives,” Zaza said. Sudan is ranked 174th out of 180 countries in the 2015 Reporters Without Borders press freedom index. Media experts say they do not see the light at the end of the tunnel soon. “Media space will not open as long as the Islamists are in power in the Sudan,” Wani said. Zaza agreed: “The repression of journalists will not go away soon. It will take time”. Too often, government employs dangerous blackmail tactics to scare journalists. The Islamists accuse critical journalists of being Israeli spy, Mossad, or CIA agent, a euphemism for traitor, which is punishable by death in the Sudan, Zaza said.